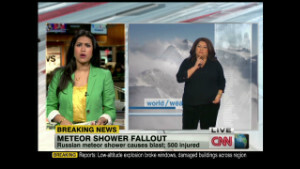 Deep Space Industries said countries should be proactive in establishing "a sentry line"
Moscow (CNN) -- A meteor streaked through the skies above Russia's Urals region Friday morning before exploding with a flash and boom that shattered glass in buildings and left about 1,000 people hurt, authorities said. Described by NASA as a "tiny asteroid," the meteor's explosion created a blast in central Russia equivalent to 300,000 tons of TNT, the space agency's officials said Friday, adding that the incident was a once-in-100-years event. The injured included more than 200 children. 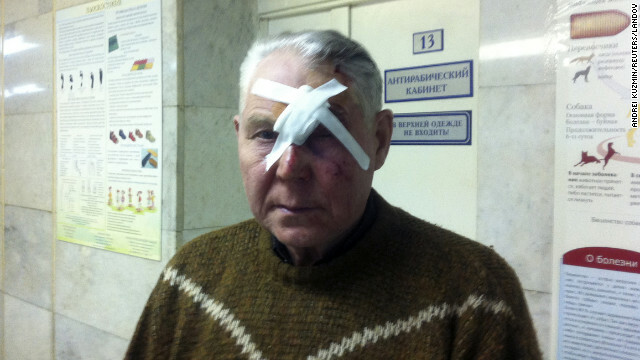 Most of those hurt are in the Chelyabinsk region, though the vast majority of injuries are not thought to be serious. What is a meteor sonic boom? 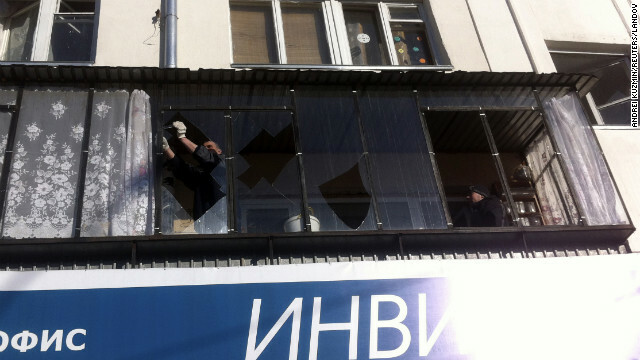 About 3,000 buildings were damaged -- mostly with broken glass -- as a result of the shock waves caused by the blast, the state-run RIA Novosti news agency said. 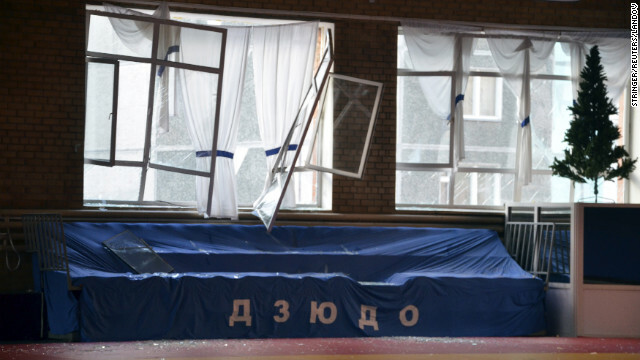 Vladimir Stepanov, of the National Center for Emergency Situations at the Russian Interior Ministry, earlier told state media that hospitals, kindergartens and schools were among those affected. 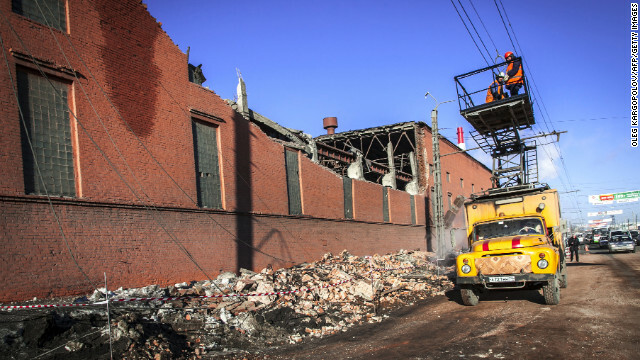 About 20,000 emergency response workers were mobilized, RIA Novosti reported. Amateur video footage showed a bright white streak moving rapidly across the sky, before exploding with an even brighter flash and a deafening bang. The explosion occurred about 9:20 a.m. local time, as many people were out and about. It was captured in vivid images by Russians, many of whom used dash cameras inside their vehicles. Dash cameras are popular in Russia for several reasons including possible disputes over traffic accidents and the corrupt reputations of police in many areas. Drivers install the cameras for their own protection and to document incidents they could be caught in; on Friday, they were able to document a spectacular natural phenomenon. 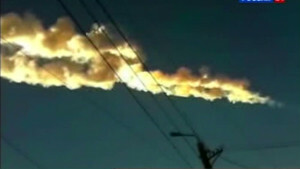 CNN iReporter and Instagram user Max Chuykov saw the meteor trail from the city of Yekaterinburg. He shared on Instagram that it was "close to the ground." 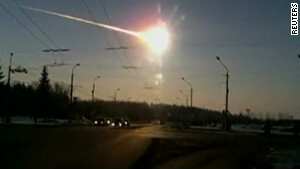 Witness Ekaterina Shlygina posted to CNN iReport and wrote on Instagram: "Upon Chelyabinsk a huge fireball has exploded. It wasn't an aircraft." The national space agency, Roscosmos, said scientists believed one meteoroid had entered the atmosphere, where it burned and disintegrated into fragments. 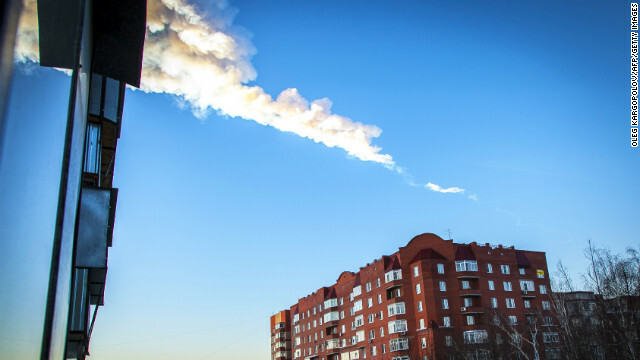 The resulting meteorites are believed to be scattered across three regions of Russia, one of them Chelyabinsk, as well as neighboring Kazakhstan, the news agency said. 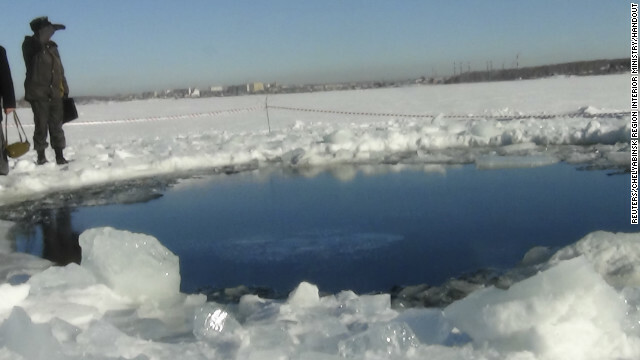 One large chunk was discovered in a lake in the Chelyabinsk region, RIA Novosti cited the Chelyabinsk governor as saying. 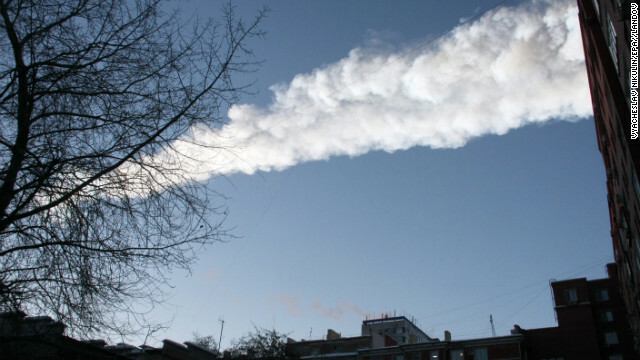 A spokesman for the Emergency Ministry for the Chelyabinsk region told CNN earlier Friday that 524 people there were injured and 34 hospitalized. 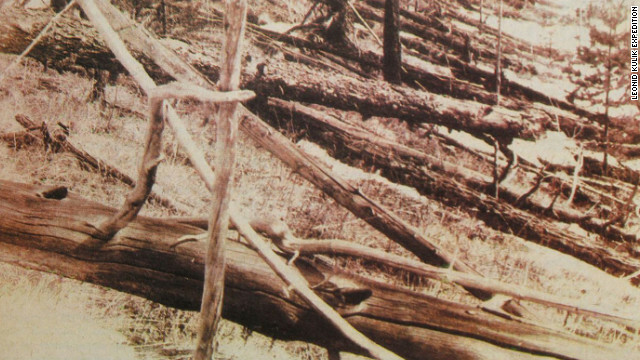 For sky watchers, the reports bring to mind the famous Tunguska event of 1908 in remote Siberia, in which an asteroid entered the atmosphere and exploded, leveling trees over an area of 820 square miles -- about two-thirds the size of Rhode Island. About 80 million trees were felled, radiating out from the center of the blast, but no crater was left. 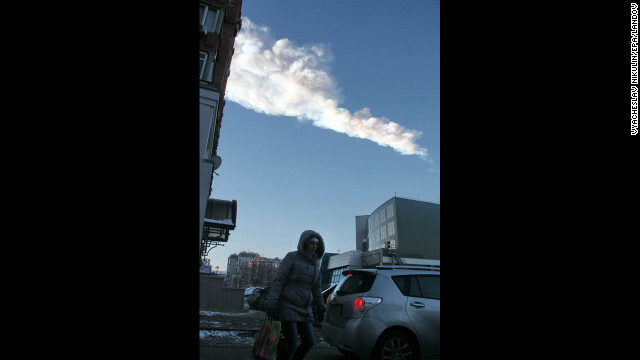 Friday's Chelyabinsk meteor came on the same day that a hefty asteroid charged past Earth. 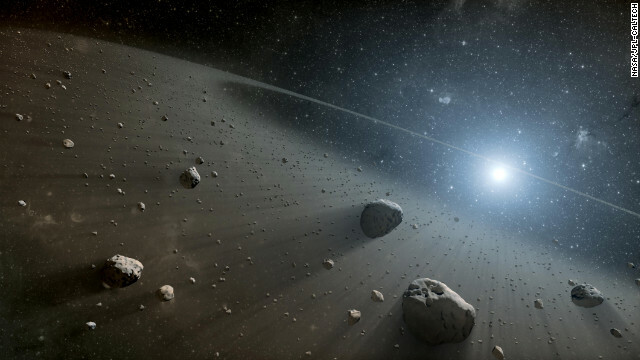 Known as 2012 DA14, the asteroid is thought to be 45 meters long, about half the length of a football field. But scientists say it came not much closer than 17,100 miles from our planet's surface. Officials from around the world were quick to call for greater vigilance in monitoring meteors. "Today's event is a strong reminder of why we need continuous efforts to survey and identify near-Earth objects," said Thomas Reiter, European Space Agency's Director of Human Spaceflight and Operations. Deep Space Industries, a recently created space exploration company, said countries should be proactive in establishing "a sentry line of spacecraft circling the Earth to intercept and evaluate incoming threats." "The hundreds of people injured in northern Russia show it's time to take action and no longer be passive about these threats," said Rick Tumlinson, chairman of Deep Space Industries. This graphic shows the path Asteroid 2014 RC will take as it passes Earth on Sunday, September 7. The space rock will come within one-tenth the distance from Earth to the moon, but it is not expected to threaten the planet. 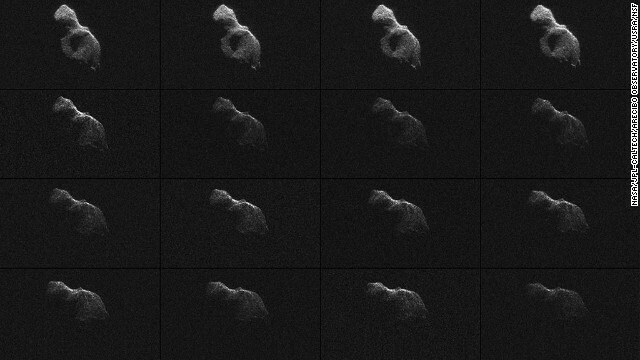 NASA scientists used Earth-based radar to produce these sharp views of the asteroid designated "2014 HQ124" on June 8. 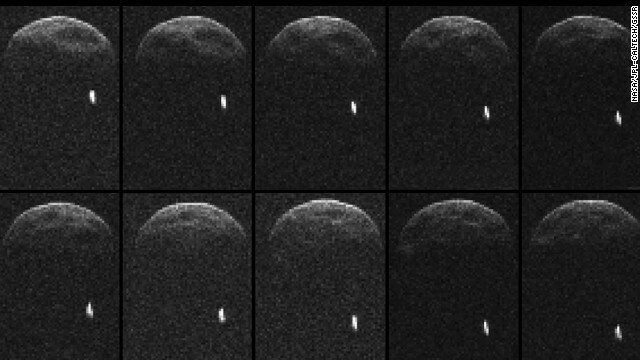 NASA called the images "most detailed radar images of a near-Earth asteroid ever obtained." 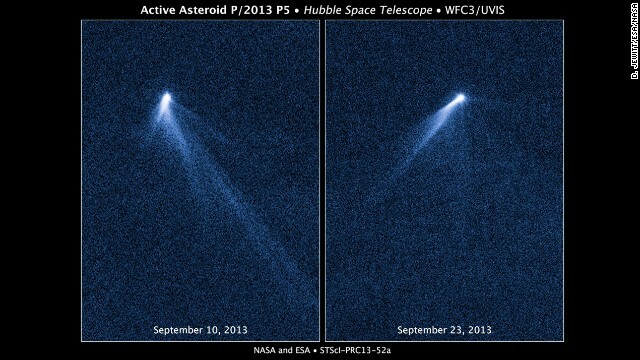 The Hubble Space Telescope snapped a series of images on September 10, 2013, revealing a never-before-seen sight: An asteroid that appeared to have six comet-like tails. A diagram shows the orbit of an asteroid named 2013 TV135 (in blue), which made headlines in September 2013 when it passed close by Earth. The probability of it striking Earth one day stands at 1 in 63,000, and even those odds are fading fast as scientists find out more about the asteroid. It will most likely swing past our planet again in 2032, according to NASA. Asteroid 1998 QE2 is about 3.75 million miles from Earth. The white dot is the moon, or satellite, orbiting the asteroid. 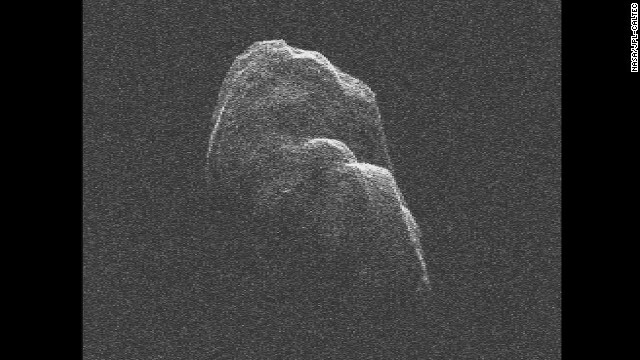 Asteroid 2012 DA14 made a record-close pass -- 17,100 miles -- by Earth on February 15, 2013. Most asteroids are made of rocks, but some are metal. They orbit mostly between Jupiter and Mars in the main asteroid belt. Scientists estimate there are tens of thousands of asteroids and when they get close to our planet, they are called near-Earth objects. 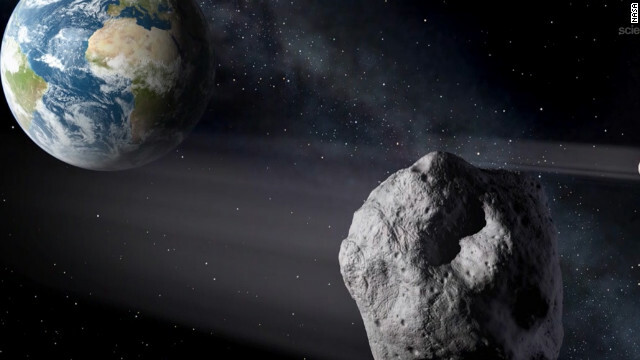 Another asteroid, Apophis, got a lot of attention from space scientists and the media when initial calculations indicated a small chance it could hit Earth in 2029 or 2036. NASA scientists have since ruled out an impact, but on April 13, 2029, Apophis, which is about the size of 3½ football fields, will make a close visit -- flying about 19,400 miles (31,300 kilometers) above Earth's surface. The images above were taken by the European Space Agency's Herschel Space Observatory in January 2013. 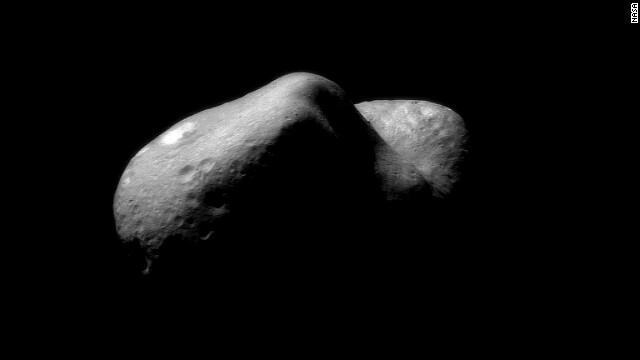 If you really want to know about asteroids, you need to see one up close. NASA did just that. A spacecraft called NEAR-Shoemaker, named in honor of planetary scientist Gene Shoemaker, was the first probe to touch down on an asteroid, landing on the asteroid Eros on February 12, 2001. This image was taken on February 14, 2000, just after the probe began orbiting Eros. The first asteroid to be identified, 1 Ceres, was discovered January 1, 1801, by Giuseppe Piazzi in Palermo, Sicily. But is Ceres just another asteroid? 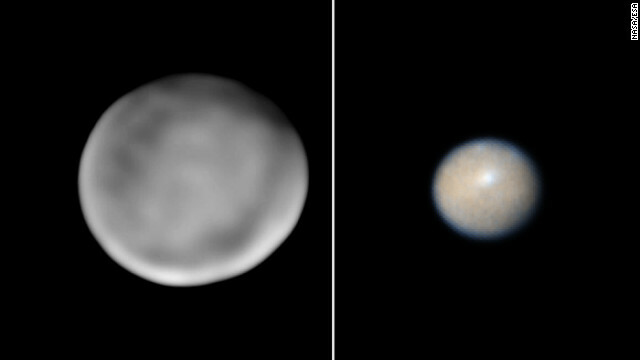 Observations by NASA's Hubble Space Telescope show that Ceres has a lot in common with planets like Earth. It's almost round and it may have a lot of pure water ice beneath its surface. Ceres is about 606 by 565 miles (975 by 909 kilometers) in size and scientists say it may be more accurate to call it a mini-planet. NASA's Dawn spacecraft is on its way to Ceres to investigate. The spacecraft is 35 million miles (57 million kilometers) from Ceres and 179 million miles (288 million kilometers) from Earth. The photo on the left was taken by Keck Observatory, Mauna Kea, Hawaii. The image on the right was taken by the Hubble Space Telescope. One big space rock got upgraded recently. 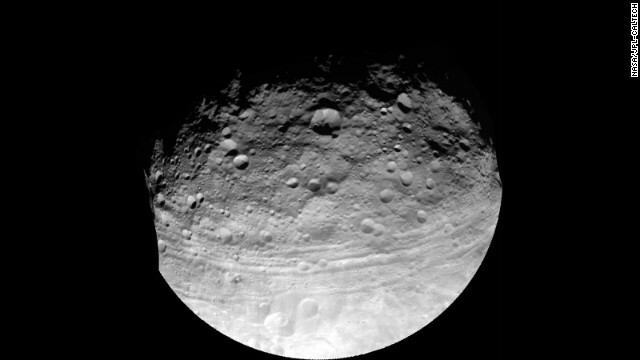 This image of Vesta was taken by the Dawn spacecraft, which is on its way to Ceres. In 2012, scientists said data from the spacecraft show Vesta is more like a planet than an asteroid and so Vesta is now considered a protoplanet. 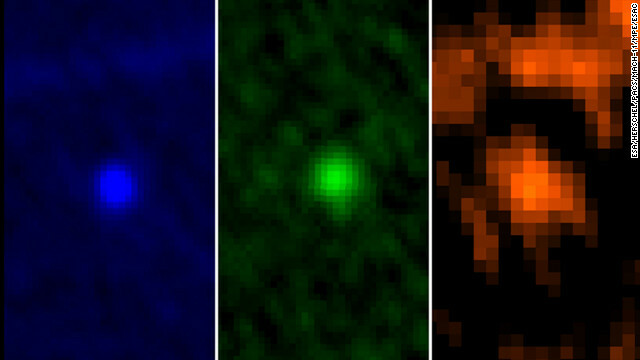 The three-mile long (4.8-kilometer) asteroid Toutatis flew about 4.3 million miles (6.9 million kilometers) from Earth on December 12, 2012. NASA scientists used radar images to make a short movie. Asteroids have hit Earth many times. 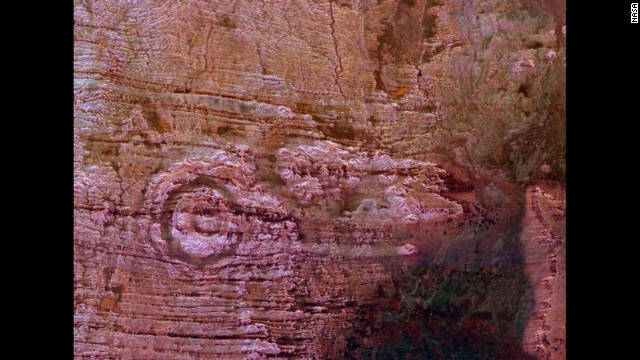 It's hard to get an exact count because erosion has wiped away much of the evidence. 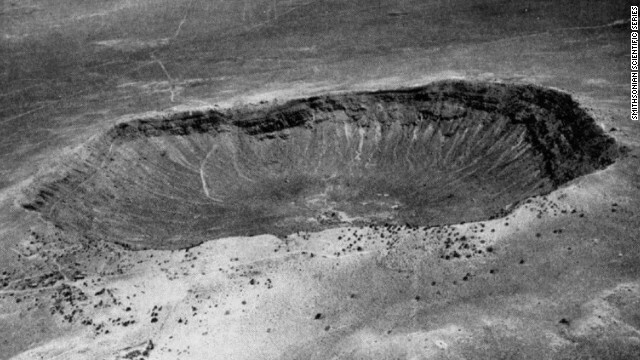 The mile-wide Meteor Crater in Arizona, seen above, was created by a small asteroid that hit about 50,000 years ago, NASA says. Other famous impact craters on Earth include Manicouagan in Quebec, Canada; Sudbury in Ontario, Canada; Ries Crater in Germany, and Chicxulub on the Yucatan coast in Mexico. NASA scientists say the impact of an asteroid or comet several hundred million years ago created the Aorounga crater in the Sahara Desert of northern Chad. The crater has a diameter of about 10.5 miles (17 kilometers). This image was taken by the Space Shuttle Endeavour in 1994. In 1908 in Tunguska, Siberia, scientists theorize an asteroid flattened about 750 square miles (1,200 square kilometers) of forest in and around the Podkamennaya Tunguska River in what is now Krasnoyarsk Krai, Russia. What else is up there? Is anyone watching? NASA's Near-Earth Object Program is trying to track down all asteroids and comets that could threaten Earth. NASA says 9,672 near-Earth objects have been discovered as of February 5, 2013. Of these, 1,374 have been classified as Potentially Hazardous Asteroids, or objects that could one day threaten Earth. 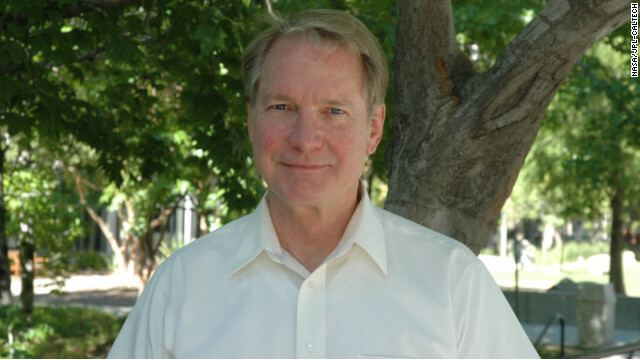 One of the top asteroid-tracking scientists is Don Yeomans at the Jet Propulsion Laboratory, which is managed by the California Institute of Technology. Yeomans says every day, "Earth is pummeled by more than 100 tons of material that spewed off asteroids and comets." Fortunately, most of the asteroid trash is tiny and it burns up when it hits the atmosphere, creating meteors, or shooting stars. Yeomans says it's very rare for big chunks of space litter to hit Earth's surface. Those chunks are called meteorites. Asteroids and comets are popular fodder for Earth-ending science fiction movies. 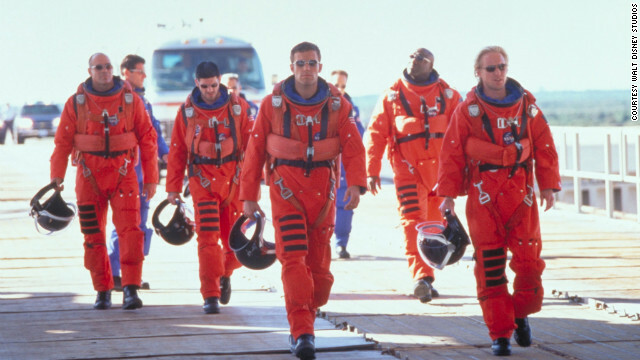 Two of the biggest blockbusters came out in 1998: "Deep Impact" and "Armageddon." (Walt Disney Studios) Others include "Meteorites!" (1998), "Doomsday Rock" (1997), "Asteroid" (1997), "Meteor" (1979), and "A Fire in the Sky" (1978). Can you name others? NASA spokesman Steve Cole told CNN that scientists had determined that the Russian meteor was on a very different trajectory from the larger asteroid. 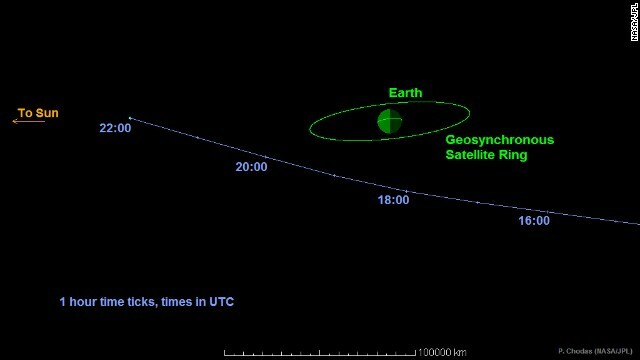 "They are completely unrelated objects -- it's a strange coincidence they are happening at the same time," said Don Yeomans, manager of the Near-Earth Object Program Office at NASA's Jet Propulsion Laboratory. "This kind of object does fall fairly frequently, but when they fall into the ocean or desert, there is no impact on people -- so this one is unusual in the sense that it's come over a populated area," Yeomans said. Cole said he wasn't aware whether scientists had foreseen the meteor's entry into the atmosphere. Because meteoroids are small, they are hard to spot and there is often little warning that they are heading toward Earth, he said. CNN's Phil Black, Boriana Milanova and Alla Eshchenko reported from Moscow, and Laura Smith-Spark wrote from London. CNN's Elizabeth Landau and Pierre Meilhan also contributed to this report.